You have to be amazed by some of the things that went on in Pilton 100 years ago. In July 1912 the bellringers of Pilton Parish Church went on a record breaking run to Bude with a ‘coach and four’. The Vicar of Pilton, who according to the records was William Henry Morris Bagley, had a brother who was a vicar on the far side of Bude. The aim was to get there and back in a day without changing horses. Although they didn’t reach the vicar’s brother, they did cover 70 miles without changing horses which was said to be a world record at the time! 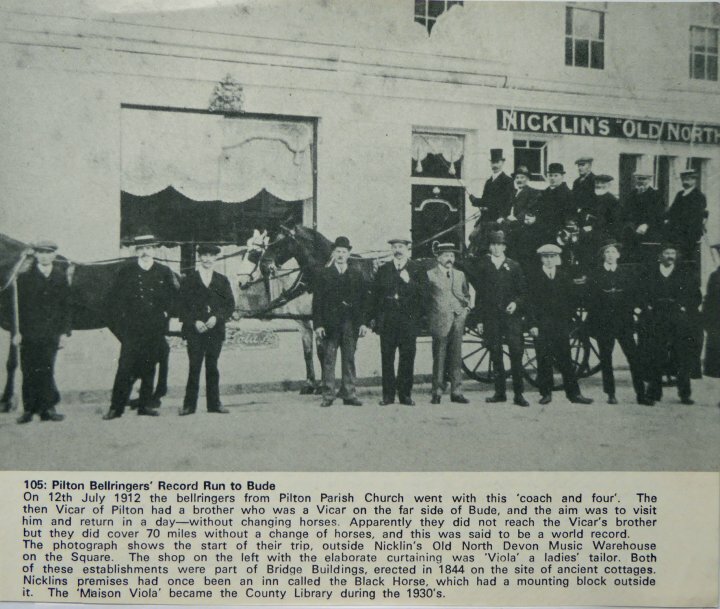 The photo is taken outside Nicklin’s Old North Devon Music Warehouse on The Square, Barnstaple, which closed in 1982, and ‘Viola’, a ladies tailor. They were located in the Bridge Buildings which were built in 1844. In the picture are Harry Samuel Stevens (a tailor in the light suit) and Herbert John Stevens (also a tailor then, second from the right), respectively the grandfather and father of John Eric Stevens who has given us this fascinating newspaper cutting. Herbert John Stevens became landlord of the New Inn in Pilton Street in 1942.